• Low Cost initial investment. • Basic Units have the same heavy duty construction as the larger units. • Shoes can be replaced easily for different types of cleaning. • Modules for air separation metering feed and additional screen area available. 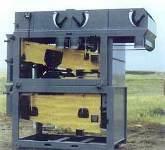 • Gentle vibratory feeder for 0% damage to crops. • Aggressive design enables handling of rough materials. • All standard bearings and replacement parts. • Designed and built by seedsmen. • Wide 54" screen can be integrated with other cleaners. • Very strong tubular construction. • Low HP requirements, 2 HP on machine and 5 HP on fan. • Large air settling chambers for even and accurate air separation. 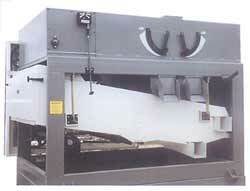 • Optional counterbalance for smooth operation. • Large range of screen area. • From 54 square feet to 240 square feet. • Available in all steel construction.